The idea of dividing humans into categories of superiority is not new. In Ancient Greece, Plato believed human reproduction should be monitored and controlled by the state. In the late 1800s and early 1900s, eugenics, the science of improving humans by selectively mating people with specific desirable traits, as proposed by Francis Galton, gained traction, with supporters including Winston Churchill, Marie Stopes, and George Bernard Shaw. Traits supposedly indicating superiority that were focused on included race, intelligence, disability, and social class. Today, science stands firmly united in opposition to eugenics. Geneticists and evolutionary biologists have shown that there are no genetic IQ differences between racial groups, and in fact established groupings by race do not correspond to specific or fixed genetic profiles at all. Despite the scientific consensus that there is no biological basis for the notion of superiority, a minority of people continue to repeat the untrue hypotheses of Victorian and early twentieth century white, male scientists. Surprisingly, the resurgence of these ideas have even reached universities. Secret eugenics conferences were uncovered at University College London last year, and even here in Trinity, The Burkean published an article entitled “Not All Are Born Equal”. This article attempted to explain poverty in Africa in terms of genetic differences between Africans and Europeans. A 1994 US bestseller, The Bell Curve, described a basis for social inequalities in innate IQ in the US, with particular reference to racial differences. The book, selling 400,000 copies in the US, provoked an outpouring of criticism from biologists after its publication. Its title has since become synonymous with the use of biology to explain social phenomena such as poverty, blaming the inferior genetics of people from ethnic minorities and working class backgrounds for their economic circumstances. The Mismeasure of Man, by celebrated paleontologist Stephen Jay Gould, is a rare case of a correction having widespread public impact. Gould systematically dismantled the claims of earlier race pseudo-scientists like Samuel G. Morton, who used ethnic skull-measuring studies as a way to explain the intellectual inferiority of the non-white “races”. Despite the efforts of public figures like Gould, Morton’s inaccurate research had spent over a century largely unchallenged and had made its mark on the development of scientific thought in that interval, shaping public consciousness on the topic of racial biology. Thus, inaccuracies about race are still being perpetuated today. In 2014, a bestseller explaining global economics through the lens of race earned the condemnation of 140 senior population geneticists. The race science phenomenon defies patient rebuttal, by continuously respawning in ever new guises everywhere it is struck down. What is clear is that for people who continue to espouse racial constructs in society, it has never been about the science. Science is seen by many today as the ultimate source of human progress and advancement, and in the age of climate change, science has become become an increasingly important vehicle for the advancement of progressive policy. This makes it all the more difficult to remember how often science has masked deeply ugly racial and class prejudices in history. Modern science was born in the urban centres of European empires, and its findings with regard to racial superiority tended to match the findings that would best justify slavery and other forms of brutal exploitation of colonised countries. Carl Linnaeus, the Swedish scientist whose pioneering work in the 18th century gave us the first formal taxonomic systems, applied his approach to humans and declared that Africans were a different subspecies to Europeans – a more lustful, careless and lazy variant of human. Francis Galton, cousin of Charles Darwin, who created the statistical concept of correlation and coined the phrase “nature versus nurture”, believed Black people were vastly inferior to other races and advocated selective human breeding to improve national “stock”, laying the foundation of modern eugenic theories. 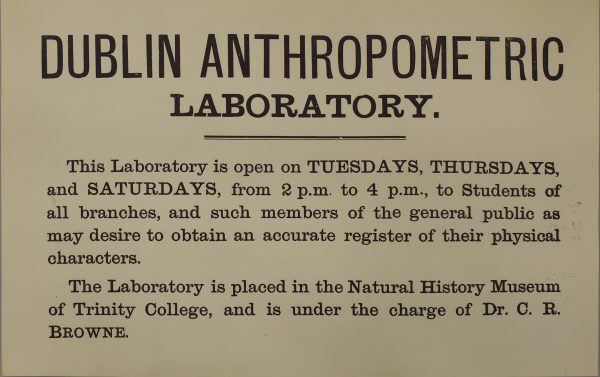 Here in Trinity, Galton founded the Dublin Anthropometric Laboratory which carried out a programme of ethnographic fieldwork in the West of Ireland, including Aran Island inhabitants. Around the same time, the director of the National Museum of Ireland was Dr. Adolf Mahr, leader of the Dublin branch of the National Socialist Party of Germany and later responsible for Ireland Redaktion, the Nazi propaganda radio service for Ireland during the war. Mahr worked closely with the 1932 Harvard Archaeological Mission to Ireland organised by eugenicist Earnest A. Hooton, using skull-measuring studies to determine the appropriate rate of Irish immigration to America. What makes this dark history relevant to contemporary science commentary is the tendency for certain science theories to be called upon to reflect contemporary politics. Not In Our Genes by Richard Lewontin, Steven Rose, and Leon Kamin, describes how the emergence of “sociobiology” was intrinsically linked to the ideology of individual responsibility associated with the prime ministership of Margaret Thatcher in the UK and presidency of Ronald Reagan in the US. This social ideology blames individual behaviours for economic outcomes in order to justify cutting social welfare and other traditional state responsibilities. After all, what is the point in funding schools in disadvantaged areas, if the reason for their poor performance is the inherent stupidity of its pupils? In this ideology poverty is the individual’s fault and not a social failing. Today’s use of race science arises in a period of right-wing defence of imperial histories and rejection of all responsibility for the displacement of refugees and migrants from former colonies of Europe. Social conflicts of the day can also dramatically shape the very landscape in which research takes place. The cultural and political conflicts of the 60s and 70s Civil Rights Movement made their way into contemporary scientific discussions. Racists and establishment figures were grasping for “sociobiology” to explain racial and economic inequality as residing within the genes of different populations to avoid taking any social responsibility for the problem. While those advocating for civil rights and social change were backed up by the so-called radical science movement. The most memorable of the radical science groups in the US was Science for the People, which had its match in the UK with the British Society for Social Responsibility in Science (BSSRS). Endorsed by Nobel prize winners and other scientific grandees, these groups of activist scientists agitated against the Vietnam War, preached the dangers of biological warfare, and denounced the influence of industry and military funding on scientific research. The British group also used their slot on BBC show Open Door to bring attention to interrogation and crowd-control techniques used by British security forces in Northern Ireland. Crucially, both science advocacy groups patiently critiqued the ascendant race science of the day, condemning the exercise of finding biological explanations for obviously social phenomena. Due in part to the energetic campaigning of these groups and their sympathisers, science was dragged kicking and screaming from its racist history and into the light of progress. Sociobiology is no longer acceptable in respectable scientific circles, and “radical science” has by and large been vindicated by history. These wars for the soul of science have seemingly been forgotten, but remembering them is all the more important in an era when new conflicts between science and racism are starting to emerge. The political pendulum within science can swing dramatically in the opposite direction. James Watson received his Nobel prize for the discovery of the structure of DNA in 1962. Watson has recently been stripped of his Cold Spring Harbour Laboratory honours and had his name removed from a UCC building for proclamations on the intellectual inferiority of Africans, despite apologising for similar remarks in 2007 and acknowledging their lack of scientific veracity. In the Mismeasure of Man, Gould emphasises that race science and the related doctrine of biodeterminism always reemerges during times of economic difficulty. True to form, “science” has become the weapon of choice for many reactionaries in the counteroffensive against the social gains of progressive movements across most of the West. Historically in the US, “eugenic inspection” was proposed to filter genetically inferior immigrants from entering the country and different countries were investigated for the quality of their national “stock”. In a parallel sphere, homophobic people have used the idea of “nature” to oppose gay rights, branding it as “unnatural”. “Natural law” justified the social and legal structures of the Middle Ages, and although the language of “biology” has usurped “nature” today, it is similarly used to naturalise specific social conditions to political ends. This idea of inherent nature or biology is a construct which acts an excuse for the marginalisation or persecution of many groups of people from the LGBT+ community, to lower social classes and people living in Africa. This so-called science that is called upon by those who use it conveniently fits pre-existing political ideas. In an age where Peter Casey is runner-up in our own Presidential election, Lega tops the polls in Italy, and now Vox enters the Spanish political scene with a stable 10% in the polls, it is not surprising that using “science” to justify those politics has reemerged, just as a radical science opposed to it emerged during a major period of emancipatory social change. Europeans are not always comfortable with the histories of extraordinary violence and exploitation that supported their own countries’ development. It is easier to believe that everyone got where they are by their own hard work, or even innate biological potential, than it is to believe that billions across the world are living in abject poverty through no fault of their own. Worse still is the knowledge that this poverty is vital to our own economies, so unthinkable that it is nearly invisible. Images of the conditions in the African Cobalt mines vital for the construction of a smartphone are not splashed across the phone company’s website, for example. There is a vast market for a “science” that tells us that the current social and economic inequality in the world is not our fault, and that the privileged of today are privileged only by natural gifts and hard work – a “science” that fought tooth and nail against the radical scientists of the 60s and 70s. These pseudo-scientific ideas about the intrinsic value of humans has real life consequences. In 2017, Heather Heyer was killed in a hit-and-run attack by a participant in the “Unite the Right” rally in the US, a rally largely organised online. Only a short time ago, a gunman opened fire at two New Zealand mosques killing 49 people and wounding more than 40 more. With the worrying spate of arson attacks on direct provision centres across Ireland, we mustn’t be naive about the prospects of something similar happening closer to home. The radicalised right slip into an ugly online mosaic world assembled out of the shards of real scholarship, where white people are inherently smarter than black people and immigration poses a threat to the future of the white race. Too deep or too long submerged in this world, and suddenly racist violence becomes rational, even ethical. People are mistaken to characterise the alt-right as anti-intellectual. They are not. They’re living in an alternative reality where they take their alt-scholarship and alt-science very seriously, a reality where pieces like the Burkean’s are just seen as the scientific facts. In light of the arming of the far-right wave with racist pseudoscience, and the accompanying revival of eugenics and race science within more respected circles, it is time again for an anti-racist, even radical, Science for the People.